I've been sitting on this news for a while, but I'm stoked to finally share that OVERKILL, the debut crime novel from Dunedin author Vanda Symon, a three-time Ngaio Marsh Awards finalist and the author of the Sam Shephard series, will be published in the UK this year by Orenda Books. Orenda Books is a terrific publisher, who specialise in bringing fresh crime voices to UK and US readers - a mix of top notch 'overseas' authors who haven't been published in the UK/US before, and brilliant British debutants. 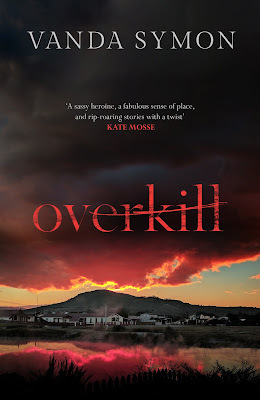 Today, Karen Sullivan of Orenda Books has given me the honour of being the first to share the new Orenda Books cover for OVERKILL. It's striking and atmospheric, and certainly evokes the 'dark times in rural New Zealand' setting of Symon's raw and powerful debut. OVERKILL will be published by Orenda Books in paperback and ebook form on 30 August 2018. There are also plans for an audiobook version. I'm very excited to see how northern hemisphere crime readers will respond to Vanda's writing, which I've admired for many years. When the body of a young mother is found washed up on the banks of the Mataura River, a small rural community is rocked by her tragic suicide. But all is not what it seems. Sam Shephard, sole-charge police constable in Mataura, soon discovers the death was no suicide and has to face the realisation that there is a killer in town. To complicate the situation, the murdered woman was the wife of her former lover. When Sam finds herself on the list of suspects and suspended from duty, she must cast said her personal feelings and take matters into her own hands. To find the murderer … and clear her name. A taut, atmospheric and page- turning thriller, Overkill marks the start of an unputdownable and unforgettable series from one of New Zealand’s finest crime writers. Congratulations to Vanda Symon and Orenda Books. You can see Vanda's official page on the Orenda Books website here.